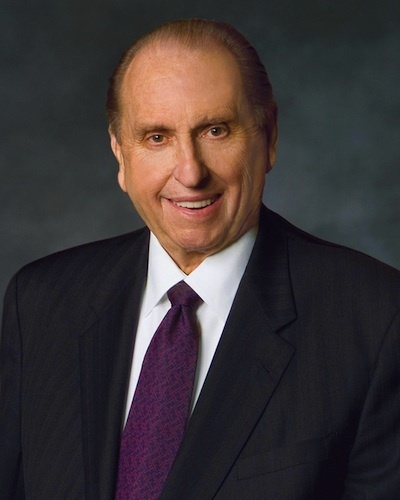 ST. GEORGE — Thomas S. Monson, the 90-year-old president of The Church of Jesus Christ of Latter-day Saints, will not be attending the church’s semiannual general conference this weekend. The church’s public affairs department confirmed with St. George News Thursday Monson’s absence at both Saturday and Sunday sessions, citing a previously issued statement regarding his attendance at church meetings. Monson was hospitalized for several days following his attendance at the April general conference. He was released after receiving treatment and fluids. He is the church’s 16th president-prophet, having served in that position for over nine years since Feb. 3, 2008, after the death of Gordon B. Hinckley. The church has operated with members of the First Presidency fulfilling the role of the president before, as was the case with former presidents Spencer W. Kimball in the 1980s and Ezra Taft Benson in the 1990s. If circumstances dictate, Monson’s counselors Henry B. Eyring and Dieter F. Uchtdorf will oversee the responsibilities of the church. Members gather for the semiannual general conference the first weekends of April and October to hear from church leadership. The conference takes place in Salt Lake City but is broadcast worldwide via television, radio and internet. I’m not watching if Tommy won’t be there. He’s the head clown of the circus. How interesting that “Tommy” would show love and respect to you, despite your disrespectful comments. I guess that fact speaks a lot about both of you. Well done 42214, you continue to expose yourself the fool. You worship the clown and the circus and call me a fool? Wow! Go back to your quilting. Worship? Nope. Again, you’ve shown how little you really know. Expose away. You want another case of Mountain Dew, I’m buying. You can really let your hair down and kick up your heels. Allowing caffeinated drinks is as crazy as allowing blacks in the priesthood circa 1974. This is quite a feather in the church’s cap. You have done some research; but not the kind that will persuade believers to sway, nor the kind to lead you to believe. I often wonder why people try so hard to discredit the LDS church. I guess because it’s so easy. It’s low hanging fruit. Tommy has become so senile they’re afraid he might be an embarrassment–maybe get up on stage and do or say something crazy. He’s become a liability. The reason why people discredit the Mormons is because they act as if they’re perfect and ridicule people for their beliefs. So they started it and keep making it easy for people to finally stick up for themselves. Just stay in your lane and I’ll stay in mine. Remember God loves all of us. I read the King James bible not 1 that’s been revised. It’s about your heart condition it’s not about if you drink coffee. You can’t buy your way into heaven. Also I don’t ask people what religion are you before I help them I just do it. Jesus didn’t go around and ask people those questions before he helped. We should obey the 10 commandments. Great point youcandoit. I can’t count how many times I have met people in social settings where I’m asked if I’m LDS. Some are sly about it, others just come right out and ask. It’s obvious that this is a “screening” to see if they want to pursue a friendship. I was even stopped once by a SGPD officer and during the course of the stop and conversation he asked me if I was LDS. I aggressively challenged him and demanded to know what that had to do with the vehicle code. He changed his tune and let me go because, just my guess, because he was afraid of a personnel complaint.